We got into some wahoo this week and we’re not surprised that young Taylor Murphy fishing with grandpa Roger Thompson got one of them. She always does well. A purple Rapala off the south end of Cerralvo Island did the trick. Birthday girl! 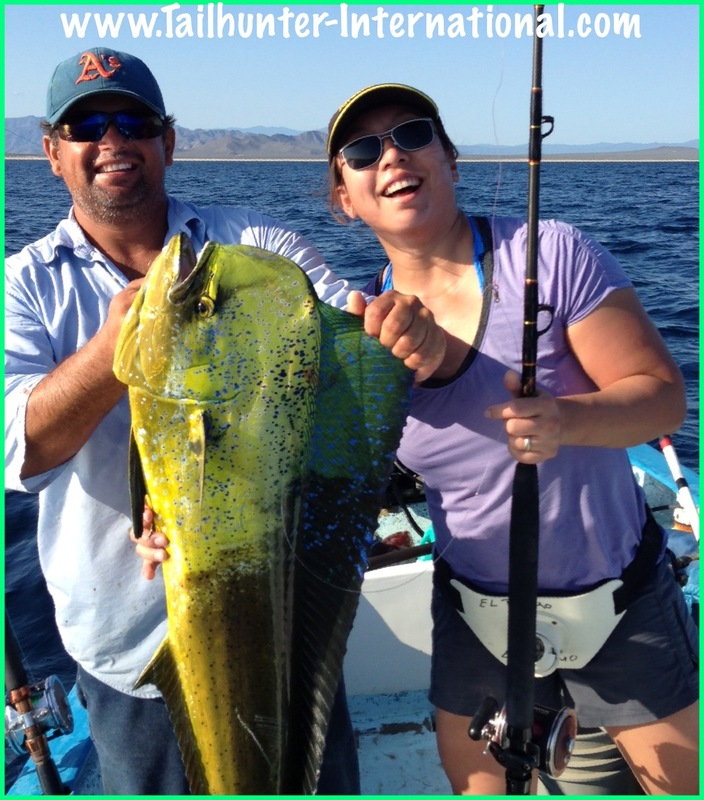 Karyn Jennings was fishing with her husband Greg and had a good birthday week with us in La Paz. 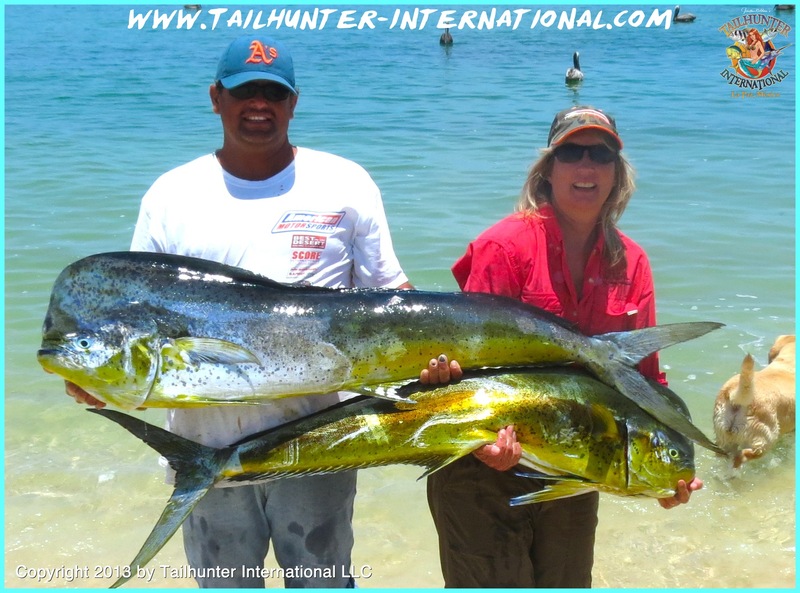 Here she shows off a day’s catch with a great mix of dorado, cabrilla and wahoo fishing with our Tailhunter Las Arenas fleet. A good bunch of fillets was cooked up at our Tailhunter Restaurant! Karyn is from Colorado. First timer, Steve Bradley who lives in Northern California on the Smith River was out with Tailhunter Captain Pancho and got his first dorado just outside of Bahia de Los Muertos. He also got his first rooster, a 30 pounder that was released and lost a larger fish as well. 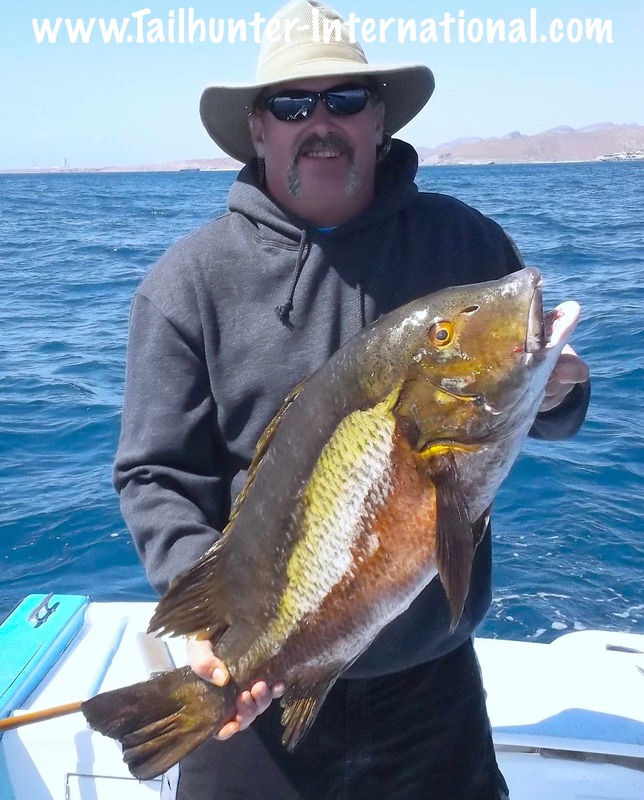 John Nagy from Marina del Ray CA slips quietly in and out’ve La Paz and just nails the fish! 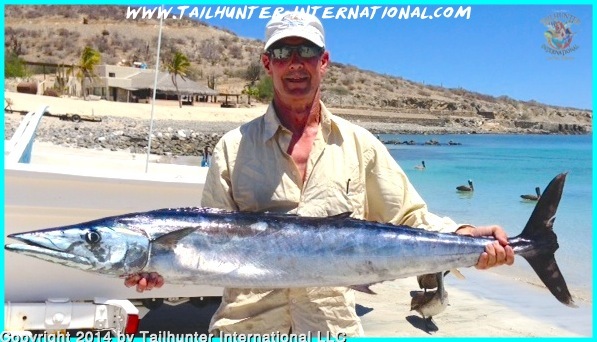 I think he got our largest wahoo of the week with this 4- pounder off the south side of Cerralvo Island on a blue and white Rapala. 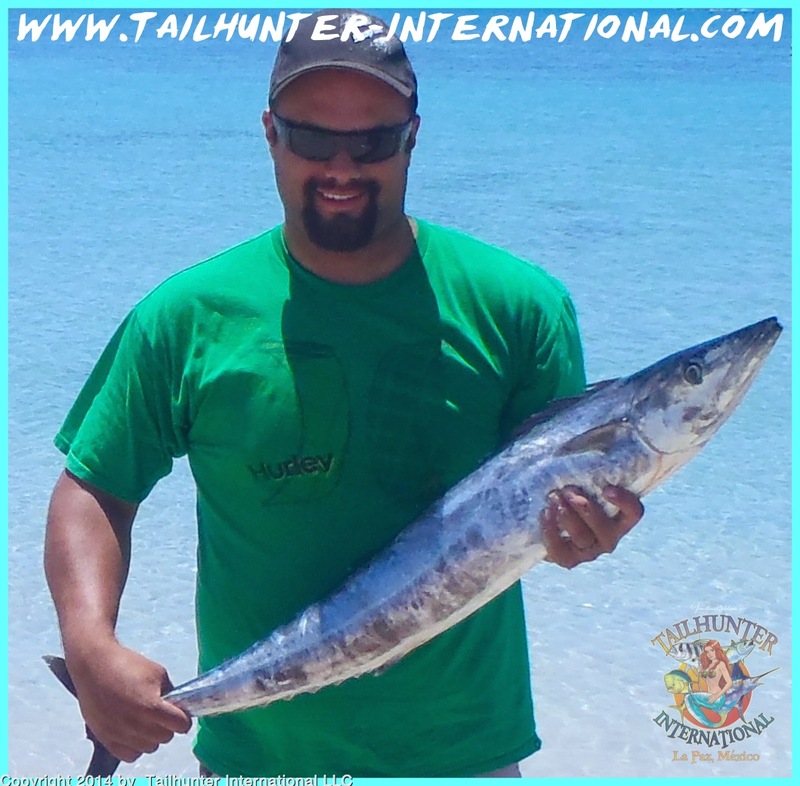 He was fisihing with our Tailhunter driver, Esteban and they also got one other wahoo, 2 pargo, and released a marlin. Nicely done! Yup…still a few lingering yellowtail around in the cooler water. 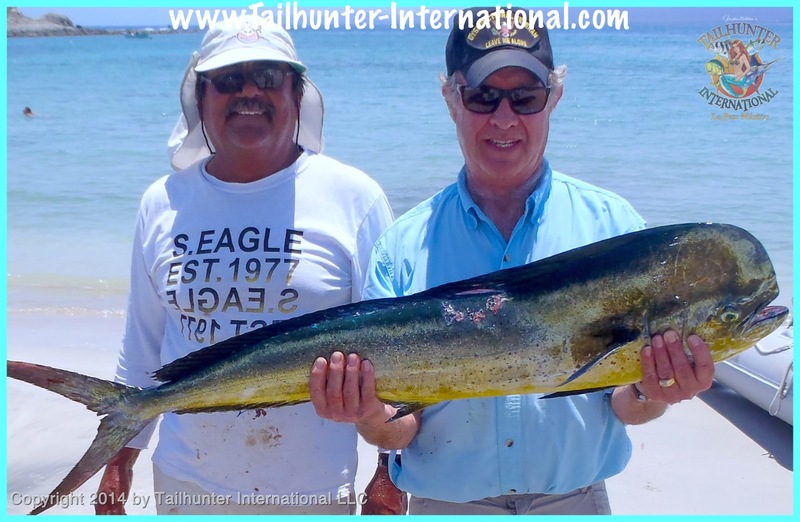 Jenny celebrates with Captain Raul from our Tailhunter La Paz fleet and shows off this big slugger forktail caught near Espirito Santo Island. Jenny is from Colorado. 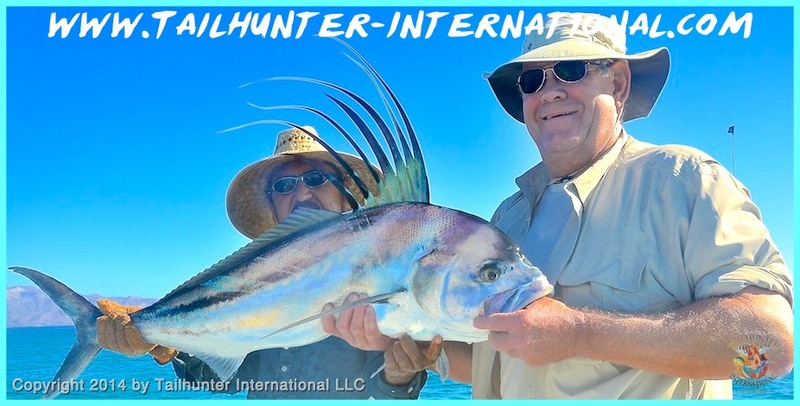 Captain Victor “El Jefe” from our Tailhunter Las Arenas fleet poses with first-timer, Ron Kling from Byers, Colorado who came down to catch his first roosterfish. On this particular day, he got 5 roosters between 40 and 50 pounds which he released! And he kept this nice dorado for dinner! Guys come for years trying to get a sniff from a wahoo fishing our area. 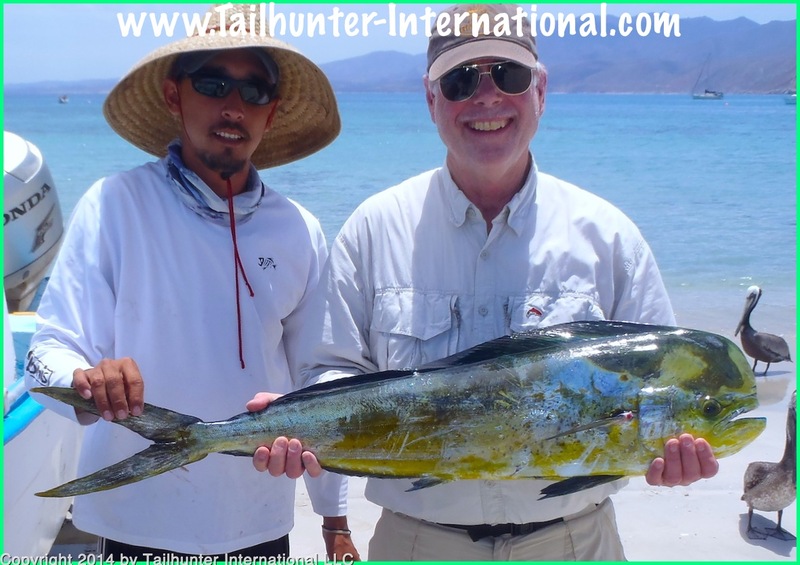 Greg Jennings nailed one his first try fishing with our Taihunter Las Arenas fleet just outside of Bahia de Los Muertos. There were good and there were bad things about this past week of fishing. Let’s start with the bad. There were some really windy days. Some cooler water temps. But those things are to be expected this time of year when things are in transition between the warm and colder seasons. Still, it didn’t always make for the best fishing conditions nor, did it help with getting bait. Basically, it’s almost like a chart…the higher the wind, the poorer the fishing. The lower the wind, the better the fishing. Overall, I’d give this week a so-so rating in terms of fishing. It’s been worse. But, normally, it’s a whole lot better. But, let’s focus on some of the positives. Take a look at some of this week’s photos. Yup…wahoo made a nice surprising reappearance this week. Around the north and sound end of Cerralvo Island, the speedy skinnies were around and willing to eat slow trolled Rapalas and bait. Sizes ranged from pinky 15 pounders up to about 40 pounds. 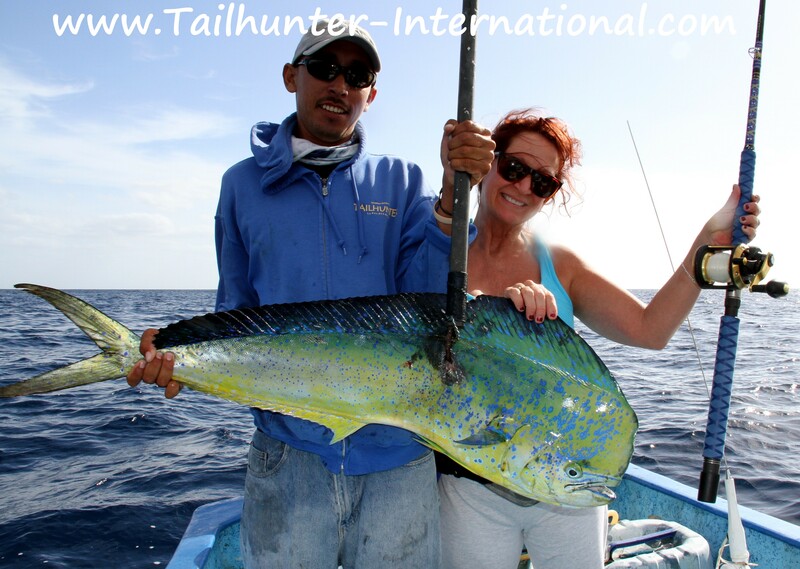 Additionally, we had a really great week on the roosters for our Las Arenas anglers. I think just about everyone who really wanted to check “rooster fish” off the bucket list got at least one. I don’t have any photos this week because, with much appreciation, all the roosters were released! 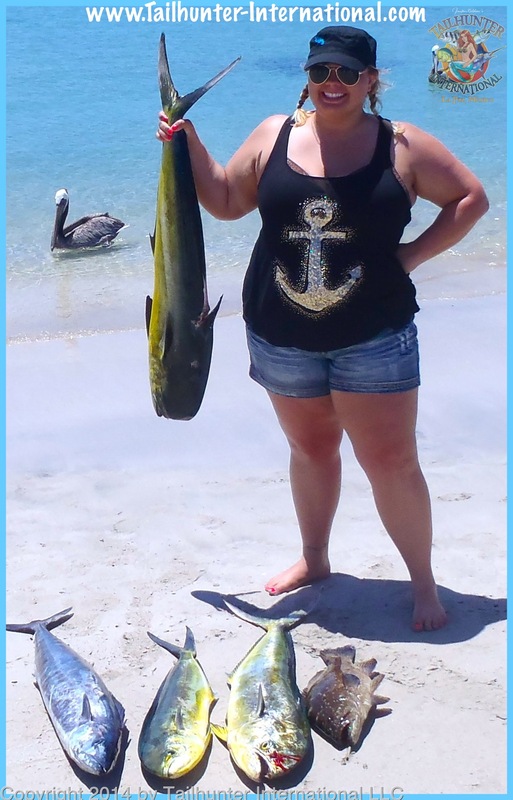 But, there were some nice quality fish taken off the sandy beach areas with fish in the 20-45 pound size and some larger that were lost. To the good stuff, add in a few marlin coming alive and taking some hits, but all of them coming off plus the dorado were still around although not in big numbers as previous weeks. I still consider the dorado to be our bread-and-butter fish at the moment. Both our Las Arenas and La Paz fleet had dorado as their predominant go-to fish. Some decent 20 pounders in the mix, but some larger fish lost to pilot error! Hope the winds slow down and the bait gets better! Should all improve as we move closer to summer! Hope you got to see it! It was pretty amazing to watch the moon go dark…then go red! It was already a HUGE full moon this week ,but extremely amazing to watch the “BLOOD MOON” eclipse! Unfortunately, combined with other factors, it might have had an affect on the fishing this past week…dangit. Captain Boli from our Tailhunter La Paz fleet helps out young Peter Koschnitzke from snowy Colorado who earned himself a cigar and a beer from dad for nailing this slugger-sized yellowtail near Espirito Santo Island. I was told it tasted great with manga salsa! Pargo were a good bet this week, but putting these tough good-eaters in the boat required some luck and skill as some of our anglers will tell you as they head straight back into the rockpiles! Tim Butterworth hung this fat hog north of La Paz on live bait. With the warmer waters, we’re already seeing some billfish around Cerralvo Island and Las Arenas. Nothing full turbo yet, by any means, but promising! 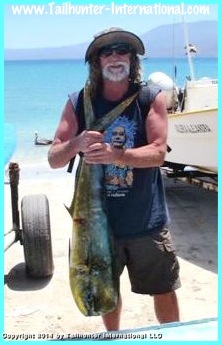 This hundred-pounder was hooked and released out by the buoys east of Bahia de los Muertos. The latest satellite shot from http://www.terrafin.com shows the heavy bodies of warm water around Cerralvo Island while cooler waters still hold north of La Paz city. Hope everyone had a safe and happy Easter week and weekend! Not the best of weeks down here. Kinda wacky actually. It’s really hard to put a finger on what happened. It was sort of a convergence of a lot of things that could have affected the fishing…a variable here and a variable there could have made the difference. But, fishing was really down! It doesn’t happen often. The track record here…like any other fishing destination that has a reputation…is that sure…you get the down day now and again. But it usually bounces back pretty fast. But, here’s how the planets lined up that could have made a difference. Any single one or two of these items usually makes no difference, but perhaps all of them converging at the same time? I dunno. Take a look. All I know is that fishing was off. 1. Stronger than normal winds…even for this time of year when it can get breezy. This week we had some white-cap days! 2. Waters got a little cooler…not warmer as has been the trend. Maybe caused by the stronger winds! Fish get lock-jawed when water temps change drastically…especially for the cooler. 3. Strong winds make it harder to get bait as the shallow areas where we get bait are spanked with waves and the bait scatters or we can’t get up close to the rocks to throw nets. 5. THE MOON! I hardly ever blame things on a full-moon, but in combination with the other factors PLUS it was not only full, but did you see the RED MOON ECLIPSE??? The moon was not only larger than normal, but it eclipsed to dark…then went almost dirty red! Here in La Paz everyone was out taking photos with their cell phones in the dark. It was pretty funny to see “photos flashes” going off! (Oh sure…that flash reaches up to the moon!). But, maybe…just maybe the fish freaked out too! Anyway, by the time you’re reading this, the full moon will have waned and hopefully the rest of these things will have settled back to normal. Either way, a weird week. That being said, it was still sunny most days…although we had some weird cloudy days when I thought it would rain. But day temps are usually in the high 80’s to low 90’s and pretty pleasant. And, we still managed a few fish here and there. 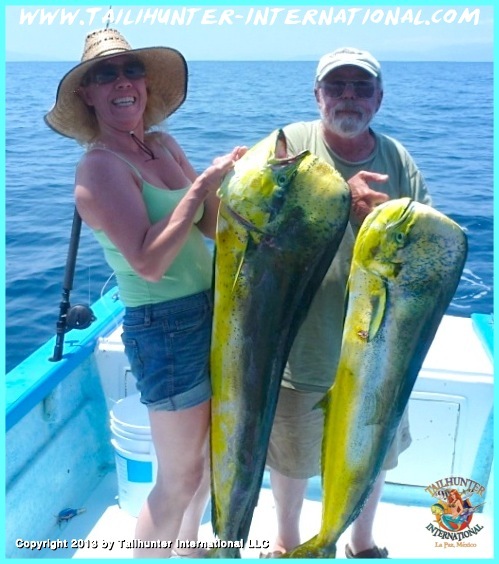 For our La Paz anglers, yellowtail up to about 30 pounds were found around Espirito Santo Island as well as some sizable barred pargo and some dorado in the 20 pound class. For our Las Arenas anglers, it was picky. Some dorado up to about 15 pounds. Some big bonito. Some snapper and pargo and a few rooster fish (released) plus some sierra along the beaches. Still better than working, but the fishing honestly could have been better and hopefully is back on track by the time you’re reading this! 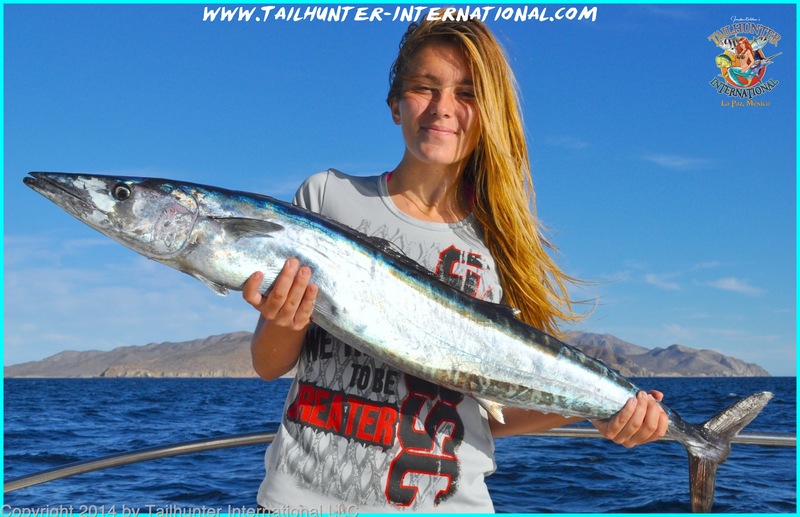 We still have a few spots open for our 2013 Western Outdoor News/ Tailhunter Sportfishing PANGA SLAM! The dates are June 17-21 and promises to be great fun, and it’s really GROWING! It was going to be a fun low-key tournament and fun get-together, but word got out! Now, it’s gotten some legs and it’s gonna be a special blast! Sponsors aboard now include: Okuma Reels, Costa Sunglasses, Yo-Zuri, Sufix, Turners Outdoors and Lazer Trokar Hooks! Additionally, Tailhunter Sportfishing is now an IGFA weigh center with certified scales and will also have the new release measuring devices for the new IGFA “release categories.” As members of the Roosterfish Foundation, we will also have devices to tag and release roosterfish in the first sanctioned roosterfish release event of it’s kind and a great opportunity to posssibly get a world record in an area that has produced arguably more world records than few other places in the fishing world. 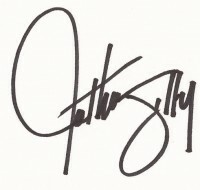 IGFA record holder, representative, author and journalist, Gary Graham, will also be on hand. We are limiting this to just 40 persons on 20 panga “teams.” Couples are welcome! Cost is $1350 per person! For more info, contact Mike Flynn at Western Outdoor News at Flynn@wonews.com or call him at 949-366-0030 extension 30. Or Western Outdoor News Editor, Pat McDonell at 949-366-0030 extension 33 or pat@wonews.com. Gonna be a real kick! That’s our story! Happy Easter to you and your family! Tim Butterworth from Petaluma has been coming to the La Paz area for many many season and been a Tailhunter amigo for almost as long! But, he never had caught a yellowtail. Until this past week where he stuck this thick one north of La Paz. This is a very special picture. 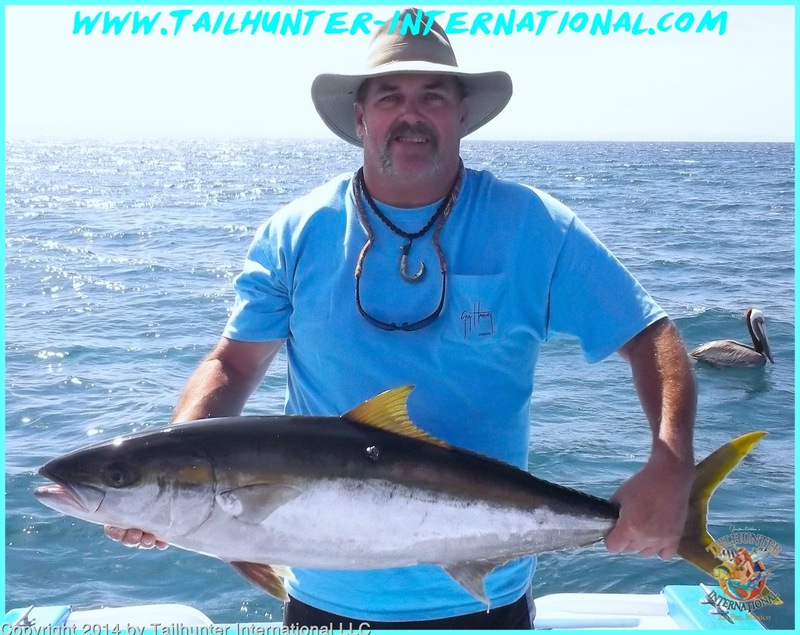 Bob Nielson has been a Baja rat for years and a good friend and clients for many seasons with Tailhunters. He was so excited because in all those years, he had never caught a sierra and was jazzed about bringing it that night to Tailhunter Restaurant to have us make ceviche. Regretfully, Bob flew home Monday evening from La Paz…went to bed…and passed away in his sleep. Bob was a great guy and there was never a dull moment. He was always a character. Our waiters at Tailhunter Restaurant called him “Bob ZZ Top!” God bless you Bob! We miss you fish brother! 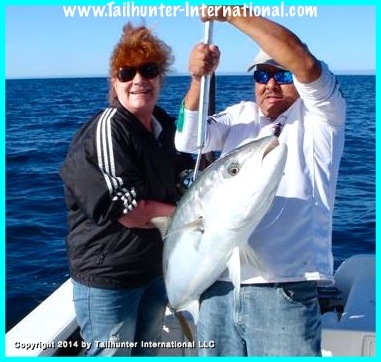 Here’s a tough fish…a big fat pargo mulato…great eating and great to catch out’ve the rocks. But, Mindy Pollock jacked up this trophy with some help from Captain Bolo around Espirito Santo Island. I love this photo! 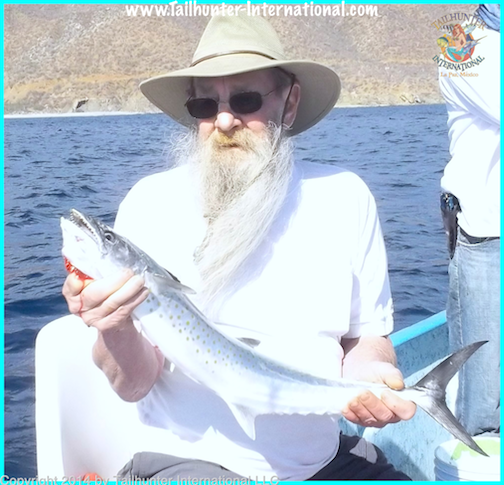 Talk about the “look” of a fishing pirate, this is our amigo from Idaho, Mick Pollock who fished with us a few days and got yellowtail, pargo and sierra but shows off one of his nice dorado. 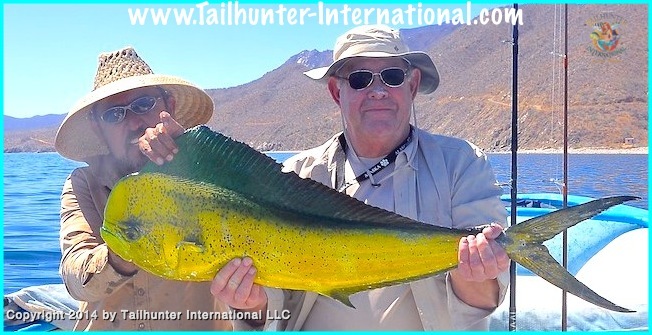 Bill Ausman from Atascadero CA was able to squeeze in a quick day of fishing with us while on vacation in La Paz and jumped on one of our pangas at Las Arenas to put the hurt on this nice bull dorado just outside of Bahia de Los Muertos. A check on the satellite water temperatures from our friends at Terrafin.com show all the warm water in our area. All that orange and red stuff is water temps i the high 70’s and 80’s! Not much cool water around! FISHING AND TEMPERATURES WARMING UP! Gosh, it’s getting warm down here! I would say it’s a bit warmer than usual, but a really pleasant week with cool morning and then highs in the high 80’s to low 90’s during the fishing day dropping to great afternoon and early evening breezes! Water temps, as we’ve been saying the last few months are warmer than normal now with most surface temperatures in tickling the 80’s as well making for some great swimming and diving, not to mention warm-water species for fishing. That being said, since we fish both Las Arenas and La Paz with our fleets, the bite this past week reflected exactly those water temperatures. Around Cerralvo Island and the Las Arenas area where water temperatures are pretty much all warm now and in the 80’s dorado have been the mainstay catch already…much earlier than normal. Fish are found in a number of places including right in Bahia de Los Muertos up close to the shore and beach then out towards the nearby buoys. You don’t have to get out that far to find the mahi! Fish size has also increased. Still alot of 10 pound schoolie-fish, but some bigger 20-25 pounders have been taken and larger ones lost. 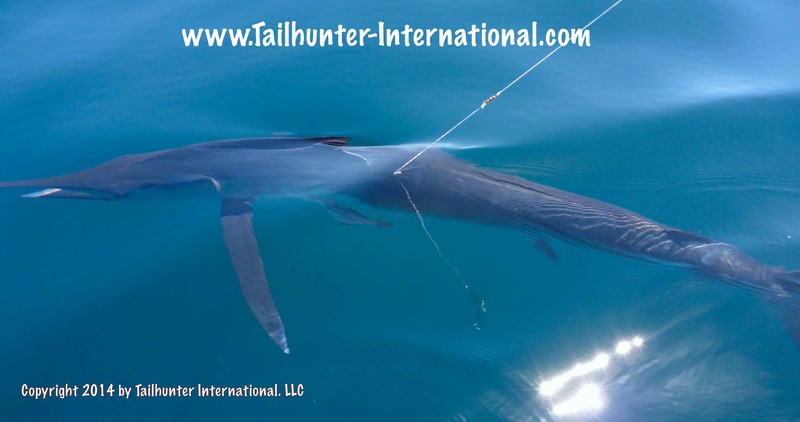 In this same area, we’re seeing an increased number of billfish as well like striped marlin. As you go north to deeper and cooler waters (relatively speaking, but still “warmer than normal”) , especially around the north end of Cerralvo Island and Espirito Santo Island, we’ve been naturally encountering the cooler-water fish including some big barred-pargo and 40+ pound yellowtail (the ones we can stop! Some of these beasts are pretty mean!) There’s also some dorado moving into the area as well as waters get warmer. Bait wise…gosh…not sure how that’s gonna play out. There seems to be zero or minimal sardines around. At Las Arenas, we’re using ballyhoo as well as stripped bonito. And, we’re using the larger ladyfish to get the bigger roosterfishg. For La Paz, we’re going out early and getting mackerel and caballitos (small jacks). 2013 TAILHUNTER / WESTERN OUTDOOR NEWS “SUMMER SLAM” STILL HAS A FEW SPOTS OPEN! Big smile for Miles! 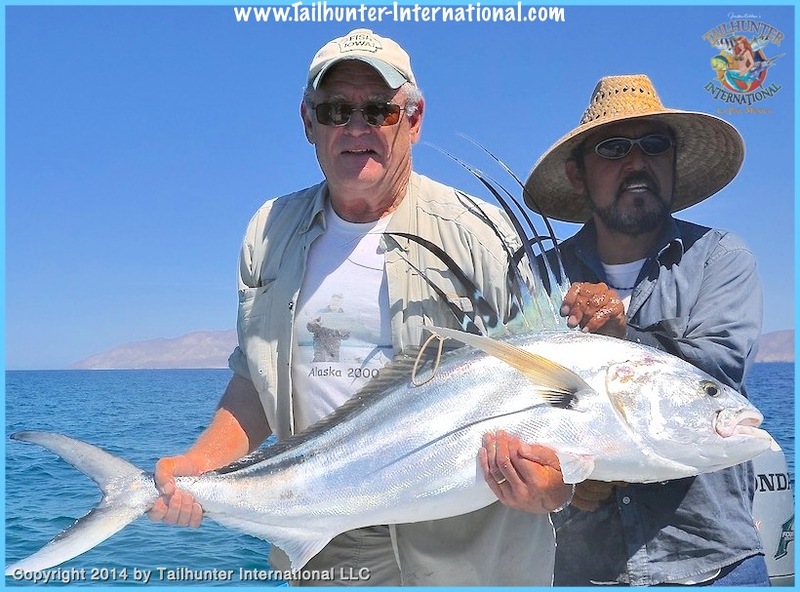 First timer to fish with us in La Paz, Miles, Brown spent the week getting some yellowtail, pargo, dorado (see below) and this nice roosterfish that he released with some help with the pose from Captain Jorge of the Tailhunter fleet. Nice to see the roosters have come in! Jeff has fished with us many times over the years, all the way from Minnesota! He had a good week on a variety of fish while he vacationed with his brothers including this trophy roosterfish they got off Las Arenas that was photo’d and quickly released! 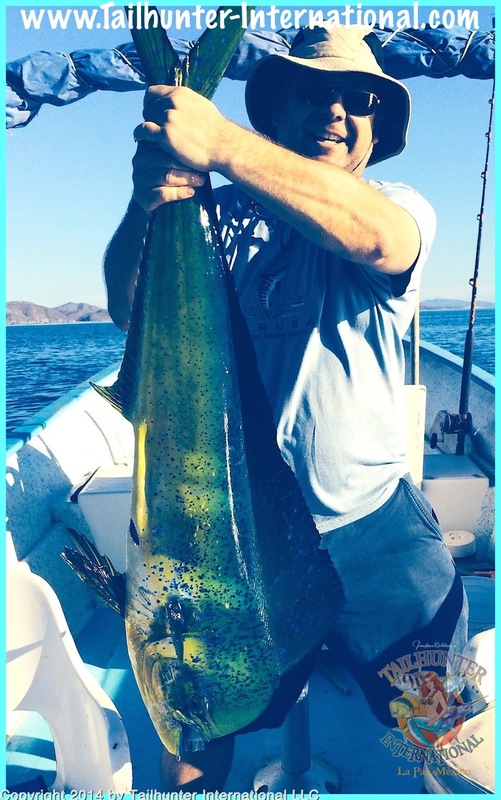 Hard to believe such nice dorado are in the neighborhood, but they’ve been a welcome surprise like this nice bull taken by Miles Brown just outside of Bahia de Los Muertos. Great eating! Folks ask all the time if it’s good on the plate and then I tell them it’s “mahi mahi” on the restaurant menus! Rod Brown from Wrangell, Alaska is one of our Tailhunter amigos who has fished with us several times a year for many years. He always does well. On this particular day they caught and released several nice roosters right off the beach at Las Arenas which can be seen nearby in the background. This past week was a bit more typical of the kind of fishing we get during the spring time. With air temps in the low to mid-80’s with great sunshine and cooler evenings and water temperatures in the high 70’s, the bite reflected the normal transitional bite we see this time of the year. We still got some breezy days that put some bump out there, but most days were not bad. Inshore fishing showed up with the usual characters. Some sierra, pargo and cabrilla were among this in the rocky reef and sandy areas. A few straggler yellowtail are here and there, but largely, with the waters a bit warmer than normal, our usual yellowtail numbers are down from normal. The best news was that we finally got into rooster fish…basically, the fish that put our Las Arenas area on the fishing map as the “rooster fish capital of the world.” The world record 114 pound rooster fish was caught on these white-sand beaches and last year, we had one of the most spectacular rooster fish seasons in all our years down here. 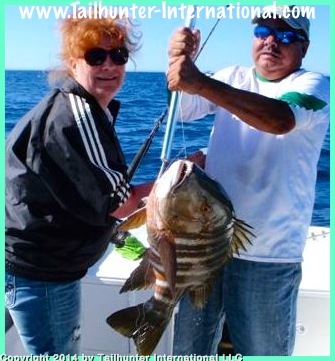 Last year, our “average” rooster was 40-90 pounds and we had a number fish over 100 pounds and one fish that was released that many estimated would have been close to 150-pounds and shatter the world record. This past week, using live bait, we finally tied into some of these exotic fish with some fish rolling right around 20-40 pounds…all released, but encouraging that the fish are in place and willing to bite. We’ll have to keep an eye out on this, but so far pretty good news. With other species, we’re still hitting the dorado as well which have really become our bread-and-butter these past few months. As waters warmed faster than normal, the dorado sort of either came in early or else never left us from last season. The fish we’re getting now are generally not schoolie-fish, but more like free swimmer solo or small group fish. However, there’s some respectable fish. Most are about 10 pounders, but there’s some 15-25 pounders around as well. Jill and I with our amigos, Pat McDonell editor for Western Outdoor New and IGFA representative; world record holder, author and journalist, Gary Graham holding one of the new official IGFA “release” scales that we now have at Tailhunters Sportfishing that can be used to officially measure catch-and-release fish. Released fish can now be submitted to the IGFA for world record status! We plan to go after a few this year. 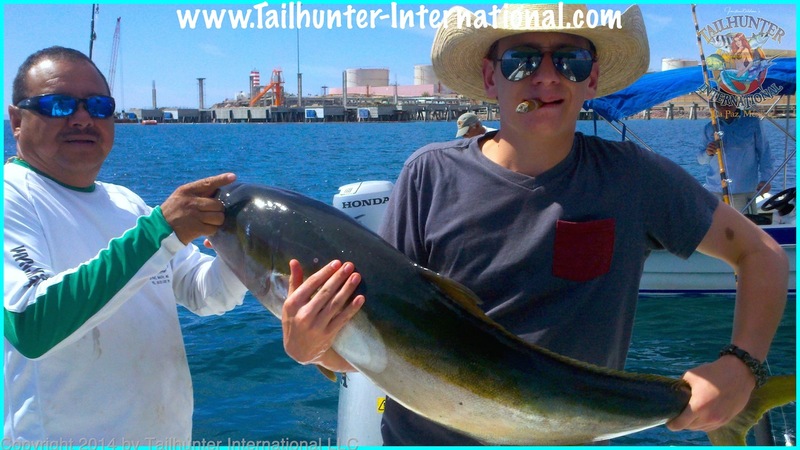 As well, our Tailhunter offices on the La Paz malecon also had a certified scale for conventionally caught fish that can be submitted for all-tackle and line-class world records. Jacques Cousteau called the Sea of Cortez the “Aquarium of the World” and with more than 700 known species of fish and more being discovered yearly, it’s easy to see why. The area around La Paz is considered one of the best light tackle fisheries on the planet and arguably more world records have been set in the surrounding waters than few other places! 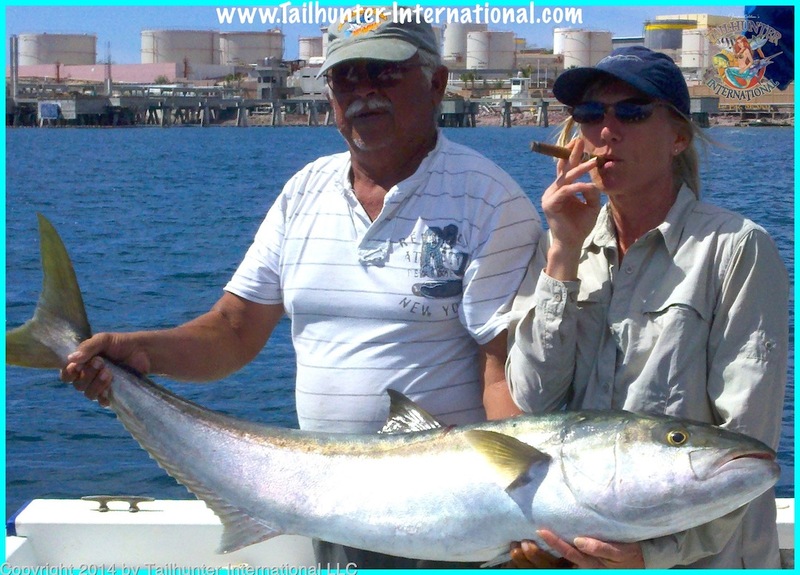 So, Tailhunter Sportfishing is jazzed to announce that we’re an official International Fish and Game Association (IGFA) weigh station. We have a certified scale at our headquarter offices on the La Paz waterfront and within a few months will have handheld certified scales for the beaches as well. Even moreso, we’re excited about the fact that the IGFA now certifies fish that are caught and released! This is great news creating more opportunities to be a world record holder. To that end, we’ve now got official “release scales” that can be brought out on one of our pangas for folks looking to catch-and-release a world record! 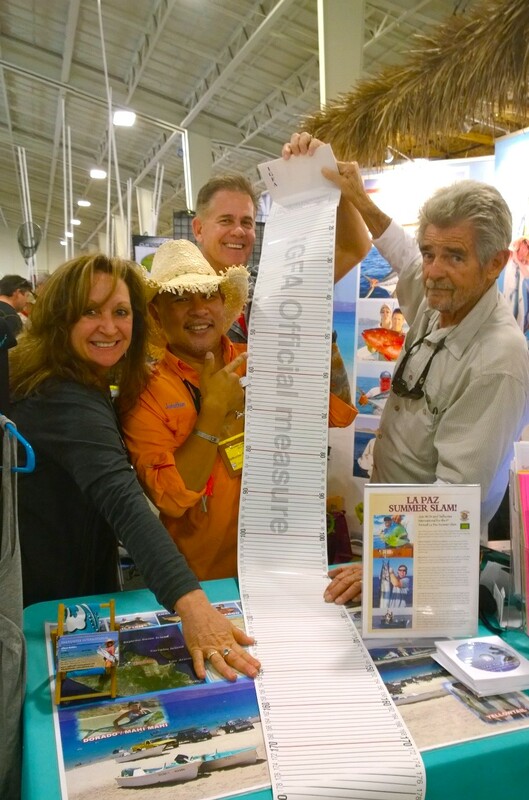 An official IGFA measuring scale MUST be used to measure and release the fish. 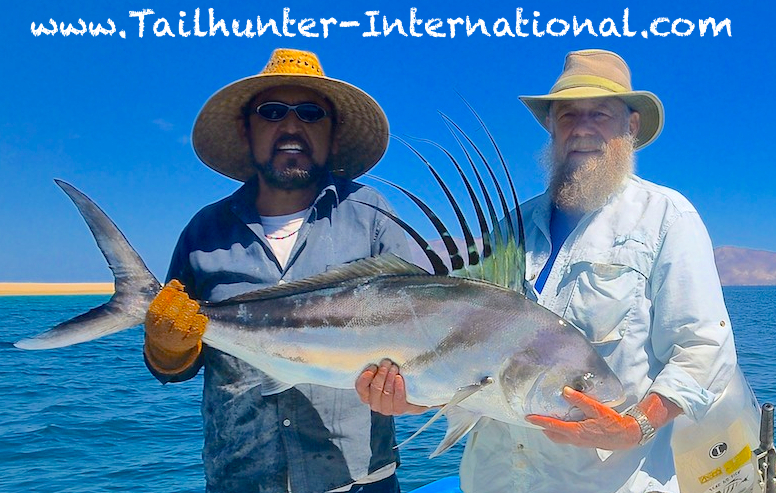 Additionally, given that Las Arenas is considered the roosterfish capital of the world, Tailhunter Sportfishing is now a member of the ROOSTERFISH FOUNDATION and we’ve ordered a number of tagging guns so that released roosters can now be tagged and recorded to hopefully proliferate the resource. We will hopefully have some of these devices in the next few weeks. All of this is great news because our “LA PAZ PANGA SLAM” being held June 17-21 and sponsored by Western Outdoor News has now turned into a great opportunity to go after some of these world release records as well as hopefully having the first official “tag and release” roosterfish event! (We still have some spots left if you’re interested, send us an e-mail to riplipboy@tailhunter-international.com). There are many categories that can be attained…especially for kids and women and line class records are always a possibility as well. 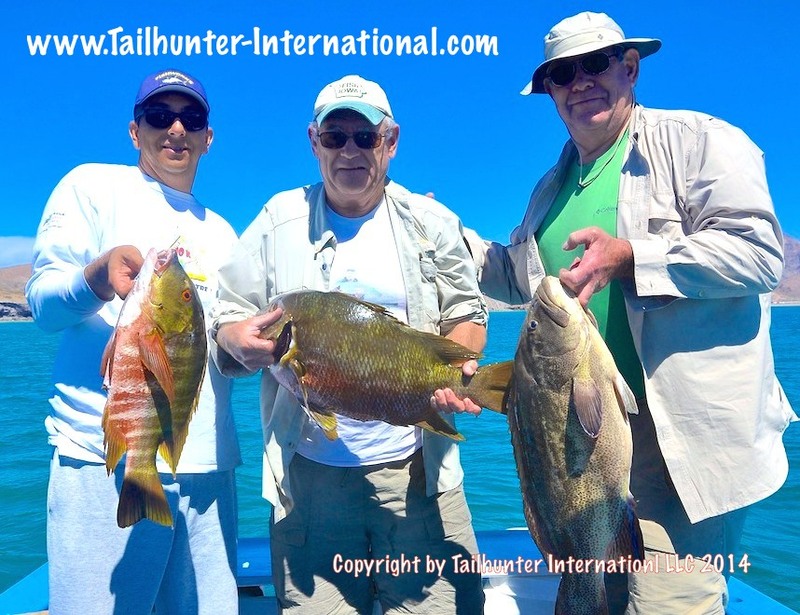 Last year, we had 4 potential world record fish caught by our clients! We’ll keep you updated as this comes along!